Enough people have been asking me lately about finding copies of Leonard Starr's Mary Perkins On Stage Volume 1. They are long gone folks, unless you want to pay some joker $200.00 for a copy on amazon.com, for which I am both flattered and appalled. So I've decided to go back and totally redo the book, fixing typos, doing a bit of a rewrite on the Starr bio info, and totally rescanning the artwork. The price for a single copy of this reprint will be $21.95 per copy. The book is scheduled for a December 2012 release along with On Stage Volume 11. Pre-orders are now available on the Classic Comics Press website. I have a question: The Rusty Riley book is cheaper than your average CCP book and the cover is reproduced smaller in your front webpage... Is going to be in a different format than the rest of the books? Like smaller or something? Also, is Big Ben Bolt going the way of Dondi? Like being discontinued? I hope not. Ooops, I see Big Ben Bolt Vol. 2 is coming soon. Forget my question then, but I'd really like to know more details about the format of Rusty Riley. Thanks and keep up the good work! Regarding Rusty Riley - I was originally going to do the book in a slightly smaller format to save a little money, but then thought better of it. But...I am going to still do something a bit different - the book will still be 8 !/2 X 11 landscape format, but instead of having 3 dailies per page, I will be dropping it down to 2 per page. It'll prove to be a bit shorter storyline but the art will be better represented. Great idea, I totally agree the art will be better represented. 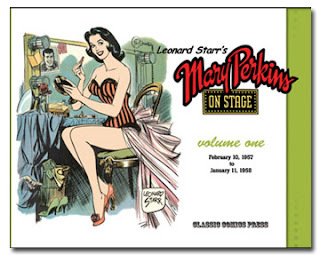 BTW, can you believe over 3 years have passed since you talked about doing slipcovers for Mary Perkins? Whatever happened to that? "now that I have the series locked down to 15 volumes I feel the best approach is to produce slipcovers for Volumes 1-5, 6-10 and 11-15. Yeah - I know. Someday. I have started to look into it again and will probably do in 2013 - by that time we will be up to volume 13 as well.